Ride 1,266 kilometers in 40 days. While the world’s best professional cyclists are hammering up the bergs and bouncing over the cobblestones, Specialized and Strava challenge you to ride the cumulative distance of five of cycling’s most storied races that form the Spring Classics, adding up to a monumental total of 1,266 kilometers (787 miles). In honor of Specialized's 40th anniversary, we're giving you 40 days to complete the Challenge. There are milestone badges to be earned at 25%, 50%, 75% and 100%, so set yourself some distance goals and make it happen. Join Specialized - lululemon riders, Evelyn Stevens and Tayler Wiles in putting in the Challenge kilometers. While you're out there, tell us about your progress and share photos from the road via Facebook, Twitter and Instagram with the hashtag #SpecializedChallenge. 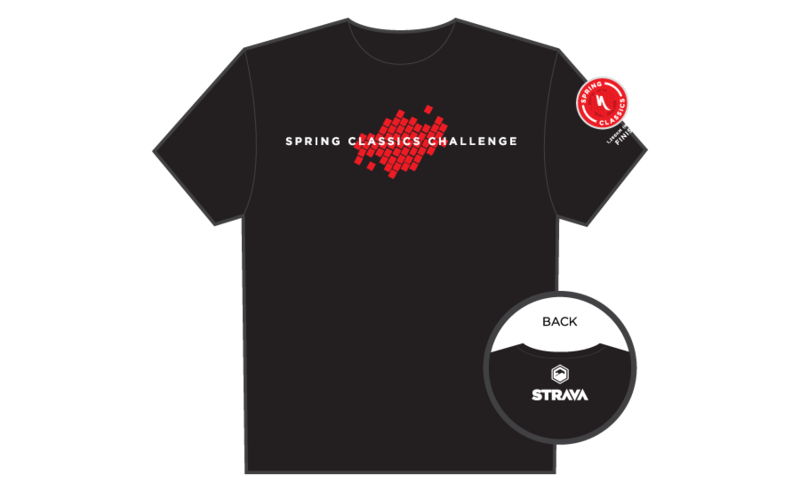 Ride 1,266 kilometers or more during the Challenge and you will unlock the ability to purchase a limited edition Spring Classics Challenge Tee. At the end of the Challenge period, qualifying cyclists will be sent an email which will include a link to purchase the tee. A 'Place Order' button will also appear below the tee on this Challenge page as well. The tee will be available to purchase until 11:59pm Pacific Time on May 7th. The expected delivery time is 3-4 weeks for domestic orders and 4-5 weeks for international. 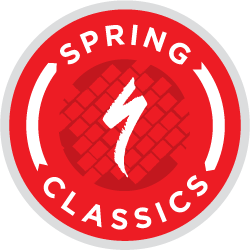 Athletes that complete the challenge of riding 1,266 kilometers in the month of April will receive a Spring Classics Challenge from Specialized digital finishers badge on their dashboard. All activities logged during the Challenge period must be uploaded to Strava no later than May 7th, 2014. Strava (“Sponsor”) is pleased to introduce the Specialized Spring Classics Challenge (the “Skill Challenge”) made available at www.strava.com (the “Site”). As a condition of participating in the Skill Challenge, entrant (“You” or “Your”) agrees to be fully and unconditionally bound by these Official Rules and the decisions of Strava, whose decisions shall be final and binding in all respects, and to waive any right to claim ambiguity in the Skill Challenge or these Official Rules. You may enter the Skill Challenge by going to the Site on or before May 4th, 2013, clicking on the corresponding Skill Challenge URL that will direct You to the Skill Challenge landing page, where You will be entered into the Skill Challenge by clicking on the Join button. Starting from the day the Skill Challenge begins on March 26th, 2014, you have until May 4th, 2013 to ride 1,266 kilometers. Each activity (Ride) must be logged on the Site and cannot be inputted manually. For more information regarding how to log activities on the Site, please see Strava’s How It Works page (http://www.strava.com/how-it-works). If You successfully log 1,266 kilometers between March 26th, 2014 and May 4th, 2013, You will be a prize winner, subject to Sponsor’s verification. Any form of entry and participation in the Skill Challenge other than that described herein is void. Each prize winner will win a digital finishers badge on their dashboard (Approximate Retail Value ("ARV"): $0. Total ARV of all prizes: $0. Sponsor will announce the potential winners of the Skill Challenge within one (1) week after the conclusion of the Skill Challenge on May 4th, 2013. All potential winners will be notified via the email address associated with the potential winner’s account and will be posted on Sponsor’s Site (http://www.strava.com/challenges/2014-specialized-spring-classics-challenge). Prizes will be deemed to have been won when all conditions in these Official Rules and accompanying Terms (http://app.strava.com/terms) are met. You have not yet won a prize. The actual odds of winning any prize will depend upon an entrant’s ability to complete the Skill Challenge. Skill Challenge ends on May 4th, 2013. See Official Rules above for entry requirements and complete prize restrictions. Sponsored by Strava,500 3rd Street, Suite #110, San Francisco, CA 94107.